2 Bedroom Flat For Sale in Newcastle upon Tyne for Asking Price £150,000. 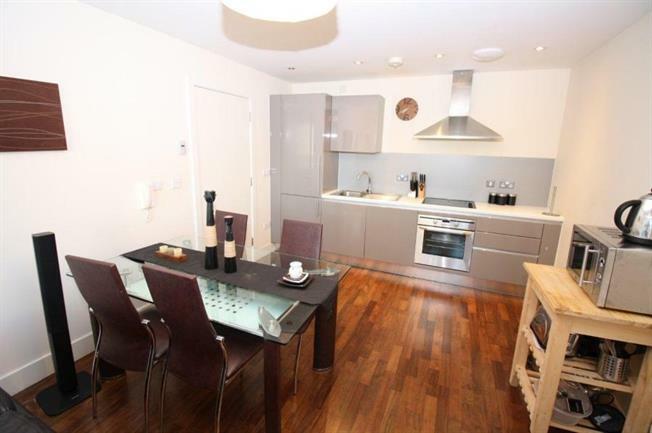 Step inside an excellent apartment in the very popular Lime Square development. There is a secure communal entrance into the apartment block with stairs or lift access leading you to the property door. Once inside you will notice the high standard finish throughout the apartment. The open plan lounge/kitchen creates of social and inviting atmosphere with a spacious balcony over looking the courtyard. Two double bedrooms are found next with the master benefiting from a modern en suite. The main bathroom has a contemporary feel, fully tiled and comprising of wc, sink and bath with shower overhead. This property benefits from resident parking. UPVC double glazed door, opening onto a balcony. Double glazed uPVC window. Electric heater, laminate flooring, ceiling light. Granite effect work surface, built-in and wall and base units, stainless steel sink, integrated oven, integrated, electric hob, over hob extractor, integrated dishwasher. Heated towel rail, tiled flooring, tiled walls, recessed lighting. Low level WC, double enclosure shower, pedestal sink, extractor fan and shaving point. Heated towel rail, tiled flooring, tiled walls, recessed lighting. Low level WC, panelled bath, shower over bath, pedestal sink, extractor fan and shaving point. Electric heater, laminate flooring, built-in storage cupboard and boiler, wall lights.